But they say they’re like Accidental Discharges: If you haven’t had one yet, just wait. But what I have had are rounds that escaped from the extractor — live rounds — that stayed in the chamber ready to go “Bang!” And for rim-fire cartridges, poking in there “under the rim” with a screwdriver or other object is a really bad idea. Measure your gun box and decide the longest rod that will fit in there. Then check your guns and, again, figure out how long the rod needs to be. Add two inches. 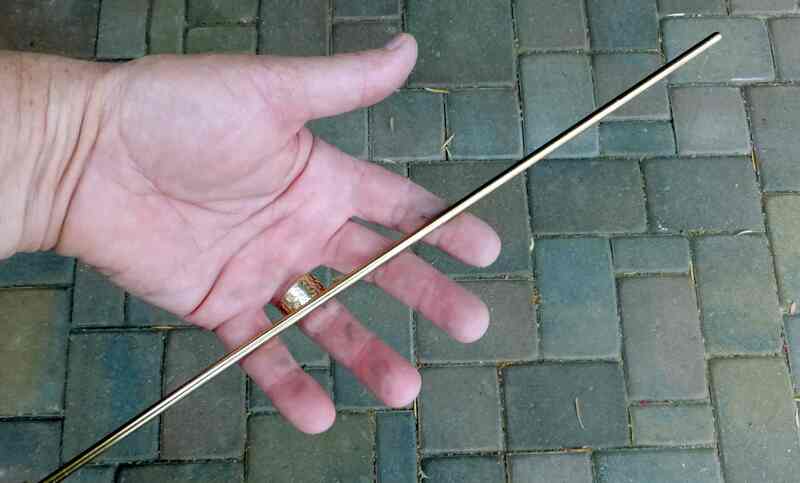 Cut the brass rod to that (+2″) length with a hacksaw. Using the metal file in your other hand, remove all burrs and round over the end by pressing the file against the far end of the rod. You want the end to be blunt but with a smooth, rounded shoulder as you can see below. Repeat on both ends of the rod. Stick the result in your gun box along with a pair of pliers or other tool to hold the rod (for safety when inserting). When used with an unfired round, there are two (2) dangerous locations. First, in front of the muzzle where the bullet comes out, and second anywhere the brass in the (now) open action may fragment. It is that latter that is particularly dangerous to eyes, spectators, hands, faces, etc. Stay clear of both areas! Here it is worth noting that, with a squib and if you know how, it may be better to remove the barrel from the gun before trying to dislodge the stuck bullet. But with a live round, do nothing of the sort! Treat any stuck live round as the unexploded bomb it is! For a live round, gently pick up the rod with a pair of pliers and, keeping the muzzle pointed in a safe direction, insert it into the muzzle. Notice you are keeping your hands away from the open end of the muzzle. Next, also keeping your face and hands (and helper / spectators) away from the open chamber, and while still keeping the muzzle pointed in a safe direction, press the far end of the brass rod against something solid such as the edge of the shooting table and push on your handgun’s grip — do not use your hand to push on the rod. Depending on circumstances, the unfired shell or squib round may come out easy, or not so easy. But with a live round, do not use a rock — if the round fires, you’ll have bullet and rock shrapnel and possibly a hole through your palm! Because the rod is brass, it is slightly softer than the barrel and, unless you’re really whacking away at a really bad angle, it should be “mostly harmless”. But if poorly placed or your pounding is too enthusiastic, you could damage a precision barrel. So make sure you line things up and use no more force than necessary. Gentle pushes will be adequate for an unextracted live shell whereas hearty taps may be needed with a squib.